It’s probably no surprise that many customers are looking for a better deal on their broadband internet plans. With so many different service providers out there these days, it can be confusing as to what to choose. Though, newcomer MyRepublic does offer some exciting yet straightforward plans on either an NBN or naked DSL connection, with those still on an ADSL connection automatically switched over to the equivalent NBN plan when the time comes. MyRepublic is an internet service provider that services Singapore, Indonesia, New Zealand and recently arrived in Australia. In Australia, it specialises in unlimited NBN plans, and also has a range of unlimited naked DSL plans. It is one of the cheapest broadband providers in every country it serves, with a specific focus on young data-hungry users and gamers. So let’s dive in and find out exactly what’s on offer from this rather mysterious internet company. Given it has a rocket for a logo, it has a lot to live up to. With MyRepublic, there are four basic plan variations, with each plan available on an NBN fibre or fixed wireless connection, as well as a naked DSL connection. There is no apparent compromise among any of these connections, but NBN’s fixed wireless infrastructure will only allow for 50Mbps downloads as the maximum speed tier – Tier 3. Fibre connections see the biggest benefit, with speeds of up to 100Mbps on NBN Tier 4. Prices normally start at $69.95, or $89.95 for NBN 100 plans, but selected Essential plans are currently reduced to $64.95 monthly, and Premium plans to $79.95 (both for your first 12 months). There are two contract types available – 12 months and month to month; there are differing setup and modem fees for each plan type. For many gamers unsatisfied with how their current providers prioritise gaming, MyRepublic may be a provider that offers a superior experience. Nothing’s worse than getting a bad score because your lag means you are a second behind the action! The modem works with both ADSL2+ and NBN, so it’s compatible wherever you go. No lock-in contracts available with the only fee being for the modem. Unlimited data that’s on Tier 3 or 4 for NBN customers. If you’re a renter or a gamer, or both, MyRepublic may be the ISP to choose as its speeds and flexibility are great selling points. Furthermore, MyRepublic is very vocal in the internet community, organising petitions and even internet-centric causes. If you’re after an ISP that actually seems to care about the products it’s selling then MyRepublic may be for you. In July 2017, MyRepublic announced Australia’s ‘Gigatown’ – a town that MyRepublic nominates to receive gigabit internet speeds. This lucky town was Wollongong in New South Wales, and initial customers who registered their interest were signed up at no extra charge. A further small group of customers were able to sign up for around $130 per month. MyRepublic appears to be keeping subscription rates low to minimise contention and deliver maximum possible speeds to end users. It’s an exciting step for those living in the 2500 district; New Zealand has its own ‘Gigatown’ in Dunedin, and it’s only fair that Australia gets its own. Barring Gigatown in Wollongong, MyRepublic’s network is largely contingent on that of the National Broadband Network. 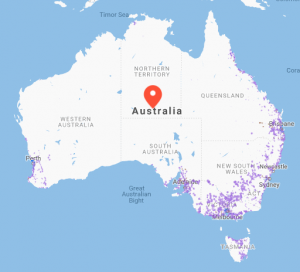 When finished, NBN fibre connections will cover 93% of the population with the remaining 7% on fixed wireless or satellite services. NBN coverage thus far covers most capital cities and major regional hubs. Inner city suburbs tend to be last to get connected due to the vast infrastructure requirements. MyRepublic has it all covered when it comes to simple broadband plans with some perks for those in the know. Gamer Plans: Static IPs, traffic prioritisation and more. Call Packs: NBN plans with calls over IP. Calls to Aussie landlines often included. Modems: Wi-Fi hub included for $1 on 12 month plans, with options to upgrade. MyRepublic doesn’t offer much in the way of entertainment, though its Gamer Plans often come with vouchers for PS4s, VR headsets, gaming mouses and more. MyRepublic kicks things off on the Standard Plus (NBN 50) speed tier, with unlimited data for a hair under $65 on its current limited-time pricing. From there you can select your contract length, with lower setup fees the longer you commit. For uncompromising speeds, MyRepublic has premium NBN for under $90. Again you get a choice of three contract lengths, with calls to Aussie landlines also included. MyRepublic boasts a variety of support & customer service options, including a call centre, social media and online chat. MyRepublic call centre hours are from 8am to 10pm on weekdays, 8am to 8pm on Saturdays and 8am to 5pm on Sundays. Alternatively you can contact them via Facebook or Twitter as well as online chat. The telco also has a range of self-help FAQs on its site designed to troubleshoot your problems before you have to call. How does MyRepublic compare to other internet providers? All in all, there’s more than just the face-value monthly fee to consider. Setup fees, modem costs and other upfront costs can all add up. While MyRepublic shines for its cheap plans, you do have to consider what type of contract to go on and compare its plans to other providers. MyRepublic has a very simple suite of plans that are the same across both DSL and NBN connections. MyRepublic particularly stands out for its fibre NBN plans, which are some of the cheapest unlimited plans on top-tier speeds. The ‘disruptive’ telco frequently beats out broadband giants such as iiNet in terms of its price and inclusions. It’s not too shabby in the Naked DSL world either, among some of the cheapest providers to offer unlimited data. MyRepublic frequently sits atop the pile in terms of data allowances and price. Across all three internet connection types, MyRepublic stands out for its no contract, fuss-free and fast unlimited data plans. We suspect a lot of people are excited by this new provider, and it’s sure to rattle a few cages in broadband land. This can only be a good thing, as competition could increase, which could also mean better value for the customer in the long term. MyRepublic had its critics when it first launched in Australia in late 2016, but this appears to have been an issue dealing with the volume of new customers all wanting to sign up straight away. Now that things are settled down, MyRepublic is well worth a look when you’re readying to compare internet plans.